So yesterday, I reminded all of you to check out the National Geographic Channel show Naked Science, which had a new episode last night titled, "Journey to Jupiter". The show covered results from the Galileo mission at Jupiter and how unanswered questions from that mission have led to a host of new missions planned for the giant planet. Overall, I thought the show was quite decent, if a bit uneven in its coverage. I thought the first half of the show covering the planet itself was excellent. The show presented several mysteries regarding Jupiter, its origins, and how it fits in with the formation and evolution of the solar system. These include the Galileo probe results which have led to the theory that Jupiter has migrated inward from the outer solar system, Shoemaker-Levy 9 observations that provided evidence for the amount of water in Jupiter's atmosphere (which the Galileo probe failed to obtain because it flew through an abnormal dry hotspot), and cloud tracking results which show how large storms evolve and persist on Jupiter. The episode also showed how lingering questions from the areas of interest have led to the development of Juno, a mission scheduled for launch in 2011. Again, the show's producers did a great job with Jupiter, in my opinion. However, since I am less familiar with gas planet research in general, I may not be in the best position to judge that parts effectiveness. The second half of the episode was dedicated to Jupiter's four largest moons: Io, Europa, Ganymede, and Callisto. During this part, I felt the show faultered a bit. No, I am not criticising it for only dedicating 4 or 5 minutes, at best, to Io, and 15 minutes to Europa. I accept the fact that Europa may generate more interest from shows such as this, and I am not going to criticise them for the editorial choice on how much to time to give each moon. However, I felt that the style of coverage, presenting a few new results from Galileo and looking at remaining mysteries, didn't carry over as well from the Jupiter half of the show to the satellite part, particularly the Io section. 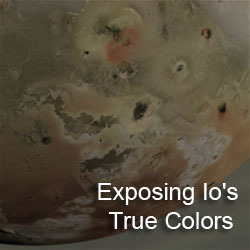 What do we learn instead from the Io section: Io has active volcanism (a surprise!) and that it is powered by tidal flexing of the moon's interior. Okay, but what about the results from Galileo? Surely, there were new results from Galileo or other aspects of Io that could be touched on briefly. Sulfur vs. silcates? 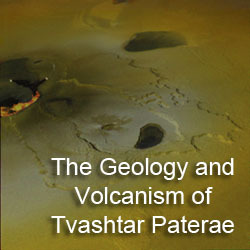 High-temperature volcanism? Maybe the radiation effects on Galileo? Nothing. 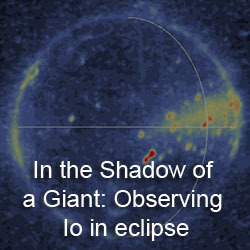 Io has active volcanism and it is powered by tidal flexing. Ganymede and Callisto faired a bit better, with a brief discussion of the results regarding their interiors and Ganymede's magnetic field. The last 15 minutes of the show were dedicated to Europa. Fine, okay, I think I can live if Europa gets her moment in the Sun. I think the biggest issue with the section may not be the producers' fault, the show was clearly completed well before the flagship downselection, but the show did spend some time discussing what a Europa orbiter would accomplish. I am a bit envious that Bob P. got to play around with huge blocks of ice (while two guys in the background tried to pretend there wasn't a film crew in their lab, from experience, 10 bucks they are pretending to work so they get to be in the shot). In my turn at being interviewed for on of these types of programs, all I got to do was point at a map or point at a computer screen (or be one of those people in the background pretending to work). Anyways, the Europa section does do a decent job in presenting the geological finding of Galileo, then it delves into astrobiology. Say it with me children, "Water DOES NOT EQUAL life." Now, keep saying that until you get it. I swear, it is like nails to a chalkboard whenever someone implies that. True, they did touch on the fact that Europa might have accessible raw materials that would be needed for native life. So I give them kudos for that (they even mentioned CO2, good on them). Now with that being said, the end of the show does present us with a potential future mission to Europa, a sub-surface submarine, by looking at a prototype being used on Earth. It presents the issues with such a mission, such as the need for autonomy and the heat source required for the sub to tunnel its way down through Europa's ice shell. Still, it would have been better, I think, for the show to stick with missions that are in the reasonable near-future. This new episode of Naked Science covering Jupiter and its moons clearly focused on the planet itself and Europa. Jovian science was well-presented from this outsiders perspective, but more care could have been done to present some of the on-going mysteries about the satellites, particularly Io, where I felt too much time was spent explaining just the basics of tidal heating.